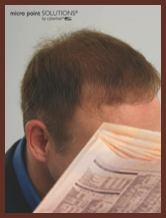 Micropoint has been developed for those whose hair is thinning. 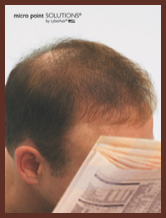 If you are one of the millions of individuals who would like more hair to fill in your thinning areas without a hair system, surgery or using topical lotions, then you will be pleasantly surprised to know that Micropoint has been a solution for thousands of people throughout Europe and Asia in recent years, and is now available for the first time in the United States. 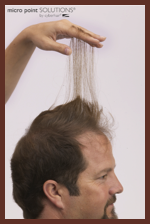 With Micropoint, you can get up to 672 additional strands of hair added to your own growing hair…in just one hour!! And if you’re a candidate, you could get thousands of additional strands of hair quickly, easily and without embarrassment! Discover the complete security and total discretion this process can offer. Micro Point Accents featuring Cyberhair are the healthy alternative to standard extensions because they are attached with a micro – sized bead of 100 hairs. No glues, heat, bonds or chemicals. 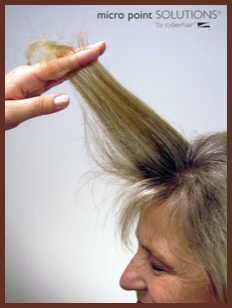 The bead is simply and safely attached to a few strands of existing hair by a trained professional. Removal is easy and non – damaging. No harsh solvents are needed. 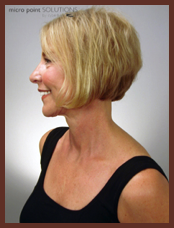 A Micro Point Accent certified trained professional can give you Micro Point Accents on the sides and back of your hair in one hour and give you hair to add body and volume to your own growing hair instantly. 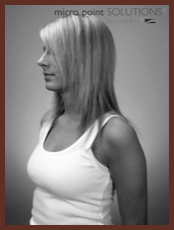 Micropoint Simplicity extensions are unlike anything else currently on the market because it uses Cyberhair. Now, you can have a fabulous new style in less time than it takes to get a trim. 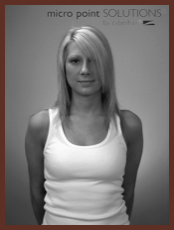 Simplicity is 100% Cyberhair and can be used to add length, volume and highlights. 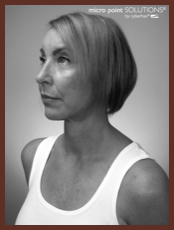 Simplicity by Cyberhair lasts 4 weeks with proper care and can be easily removed. Micropoint Simplicity is the lightest weight panel extension on the market be- cause it utilizes feather light Cyberhair. It attaches in a simple 3 step process. 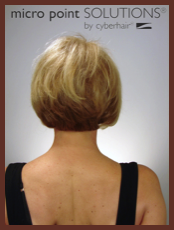 A Micropoint Solutions certified trained professional can give you Micropoint Simplicity by Cyberhair on the back and sides of your hair in under one hour, adding body and volume to your own growing hair. Micropoint Solutions is the only extension on the market using Cyberhair, the most lightweight hair available that loves water! It is a created hair that looks and feels like human hair, wet or dry. Cyberhair is feather light, many times stronger than natural growing hair, and has moisture content and style memory, allowing you freedom to be as active as you’ve always been. Think about having thousands of new strands of hair to comb, brush and style.